This special issue pays tribute to 20 years of artificial life research in Europe. Since its inception around a coffee table in Paris in the summer of 1990, the European Conference on Artificial Life (ECAL) has grown and evolved to incorporate multiple research disciplines that aim to combine the natural and computational sciences. In addition to extending a long and rich tradition in theoretical biology present at that time in Europe toward the computational sciences and engineering, ECAL has also provided a platform for different innovative ideas that have produced a significant impact on other research domains or have resulted in novel research directions with their own workshops and conferences. This influence continues today, with the consideration of the different models and methods that are currently extensively used to answer biological questions in domains such as computational and systems biology. This evolution will benefit the field and will ensure that our models continue to push the envelope as they have been doing for the last two decades. Together with the reviewers and conference chairs of ECAL 2011 in Paris, we selected a small number of especially interesting contributions among the conference's 128 accepted submissions. Their authors were asked to extend their manuscripts for a wider audience and to provide more details than what was allowed by the conference format. The reader can find below a brief description of these articles, which range from artificial chemistry to evolutionary robotics and computational biology. We hope that this selection will provide an incentive for researchers from related fields to pay closer attention to the innovations created within the artificial life community and to motivate researchers already interested in this field to make further advances in the realism and influence of their models. In the following we summarize the topics discussed in this special issue. Xabier Barandiaran and Matthew Egbert study how norms become established from an organism-centered perspective. They give an in-depth analysis and evaluation of a minimal model capable of establishing norms dynamically. The model clearly opens a novel road toward answering questions associated to the notion of minimal agency, which is essential to a wide variety of artificial life models. The work of Navneet Bhalla, Peter Bentley, Peter Vize, and Christian Jacob focuses on the use of staging in the context of physical self-assembling systems made of magnetic shapes. They investigate whether replacing a full mix with gradual addition of morphological information manages to produce more stable constructs for systems composed of elements with heterogeneous properties. They show that this staging methodology can solve complex self-assembly problems by reducing the possibilities of errors in the shape-matching process. Tom Froese, Nathaniel Virgo, and Takashi Ikegami argue in the third article that time scales should play a central role in all models aiming to answer questions linked to the origin of life. Using a reaction-diffusion model, they assert that adaptive behavior realized at intermediate time scales by spatiotemporally localized self-producing systems may have been already present in the beginnings, and conclude with the feasibility of a movement-first approach to the origin of life. 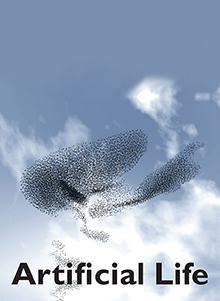 In the fourth contribution, Heiko Hamann, Thomas Schmickl, and Karl Crailsheim investigate the relevance of statistical mechanics, and more specifically of the fluctuation theorem, to understanding the collective behavior of simulated swarms. They are able to show that an inverted fluctuation theorem is present in this type of systems, which they claim may be generally applicable to different self-organizing systems studied in artificial life. Tsutomu Oohashi, Tadao Maekawa, Osamu Ueno, Norie Kawai, Emi Nishina, and Manabu Honda investigate a completely different question: Can organisms evolve to give up their immortality? Using an artificial-chemistry-based model called SIVA, they examine the evolution of programmed self-decomposition. Interestingly, they identify the conditions for mortal organisms emerging from immortal ones to outcompete them, which they associate with the emergence of an altruistic activity in terrestrial life. As mentioned earlier, artificial life modeling has a prominent role to play in computational and systems biology. The manuscript of Joshua Payne, Jason Moore, and Andreas Wagner is an example of this cross-fertilization. The authors investigate the space of signal-integration functions, which are defined as functions that map regulatory signals to gene expression states. Their aim is to understand the relationship between the robustness and evolvability of gene expression states when genetic perturbations modify these functions. They show, among other things, that the majority of signal-integration functions are resistant to perturbation. José Pereira, Porfírio Silva, Pedro Lima, and Alcherio Martinoli propose in their work a new framework to coordinate the actions of robot teams using concepts from the field of institutional economics. They first introduce the notion of executable Petri nets (EPNs), which can be run directly on a robot. These EPNs are then used to define institutions and individual robot behaviors, resulting in what they call an institutional agent controller. To validate this new approach, they design some swarm-related experiments in which robots need to coordinate to remain connected over a wireless network, showing that their novel institutional robotics framework can perform as well as some of the other approaches that aim to design swarm behavior, while offering a higher potential for modular control design and consideration of social behavior in robot teams. In the eighth contribution to this special issue, John Rieffel, Davis Knox, Schuyler Smith, and Barry Trimmer provide insight into four years of research into soft robotics. They particularly focus on the question of how to coevolve soft robot morphology and control. They argue that the evolution of soft robots corresponds to solving a problem of three tightly interdependent variables, namely material, morphology and control. In their study, they provide three approaches to address this problem, showing a way to achieve physically embodied soft robots. Within the 20 years of the European Conference of Artificial Life, numerous articles have addressed new evolutionary algorithms designed to solve particular problems or to overcome specific issues in the model originally proposed by John Holland. The ninth and last article, by Nicholas Tomko, Inman Harvey, Nathaniel Virgo, and Andrew Philippides, focuses here on the question of how to improve on prior work about niching and speciation. They suggest a new genetic algorithm (GA), called the group GA, which is based on principles of group or multilevel selection. They show that this new algorithm outperforms some of the earlier works in the same context, and that the group size need not be preset but can itself be evolved.